Not all flags are created equal! A flag is a flag; right? Actually, no. Though flags may have the same design, there are lots of variables that determine a flag's quality, durability and price. Materials vary in thickness and weight, as do grommets (the metal rings used to hang the flag). The quality of the inks used and the printing process employed determines whether your flag will fade. The weight of the thread and methods used to stitch the flag, especially on the fly ends, determines whether your flag will fray or shred in the wind. Although nylon is great for most uses, our extensive line of American flags are also available in polyester and cotton. 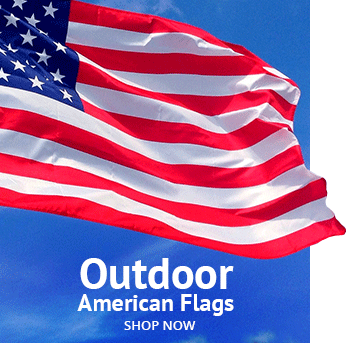 Nylon - The most popular fabric choice for both outdoor and indoor US flags. Nylon is light and durable, stands up well to the elements, and dries quickly. Because it's light, it flies well in the slightest breeze and has a bright appearance in sunlight. Click here to buy a nylon U.S. flag on sale now! Tough-Tex Polyester - The best choice for extreme weather conditions or high wind areas. Ounce-for ounce, longer wearing and heavier than nylon. Our Tough-Tex American flags are made with a special weave that has the look and feel of cotton, flies well and lasts far longer than traditional weaves. Click here to order a Tough-Tex U.S. flag on sale now! Cotton - Cotton is the traditional flag fabric, so if you're a purist, this is the fabric for you. Our Tough Tex polyester comes close, but nothing can quite duplicate the warmth of a cotton flag. Our cotton flags are designed to withstand outdoor use, but extra care should be taken to preserve your cotton flag. Click here to order a cotton U.S. flag on sale now! The usual size of a flag used on a home kit is 3'x5'. 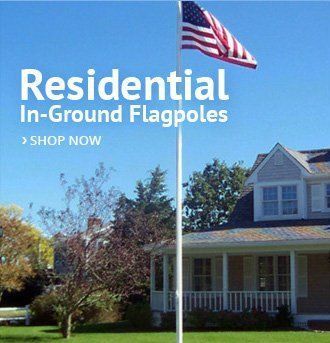 Use the flag sizing guide below for flagpoles in residential and commercial settings. When flags wear out, it shows first in the seams and in the ends where you might see fraying. 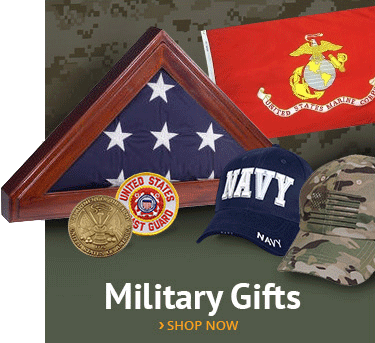 Our flags are made of the best materials and are sewn with the strongest seams. 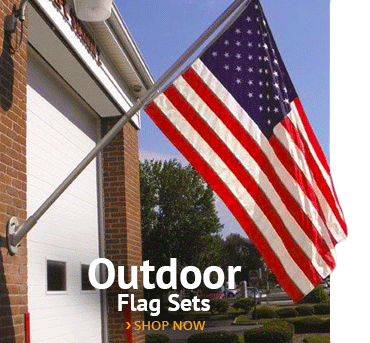 Our Tough-Tex flags are the very best you can buy and are specially engineered for durability. When you buy an American-made flag, you are not only supporting the U.S. economy, but you are buying a far superior product. If your flag does not come with a tag that says "Made in America," it probably wasn't. Companies that offer very limited guarantees or no guarantees may be selling an inferior product. Always check the guarantee. With flags, you usually get what you pay for. Low cost alternatives are likely to be foreign-made, constructed with cheap materials, sewn quickly and will wear quickly, costing more in the long run as you replace them often. 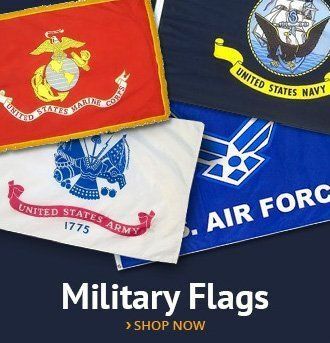 * While you may not be familiar with major flag brands, there are a few companies that have been around for hundreds of years and have perfected flag-making. We carry flags made by Annin Flagmakers, Valley Forge Flag, and Eder Flags. These are the major manufacturers and we recommend sticking with them, over no-name flags sold on Ebay, Amazon, and on some websites. * Phishing sites designed to steal your credit card information often use hyphenated domain names. We suggest avoiding websites with hyphenated domain names. * Stay away from fly-by-night online stores that make outrageous claims, feature fake customer testimonials, and boast about being the "biggest" and the "best."